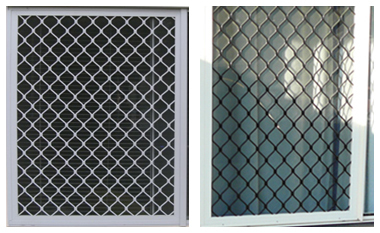 Diamond Grille Screens are the entry level into the Security Screen market. These well-known and prevalent Barrier screens are recognized by the Insurance industry and will deter the opportunistic unwanted home invasion. Made from High Grade Aluminium, these 7mm riveted screen are tested and passed according to the Australian Standards as a Barrier Screen. The frame and mesh come in a variety of Standard Colours. We recommend the internal diamond mesh be fit in Black regardless of the frame colour. Black absorbs light, therefore the Black grille is noticed less by the eye because the light is not reflecting of grille. The result is that you will be able to see past the grille easier and therefore making them less noticeable. It’s the same reason Security Mesh and Perforated mesh are black too. Of course your Diamond Grilles will have Insect Mesh applied to the inside to keep the other pests out.